Now that the weather is finally warming up, the trees are blossoming and the days are brighter for longer (despite the fact that we lost an hour of sleep).. I'm really starting to feel like Spring has truly arrived. With a new attitude towards this change in season, I've been open to trying lots of new beauty goodies from brands that I know and love, as well as brands that I am completely new to. 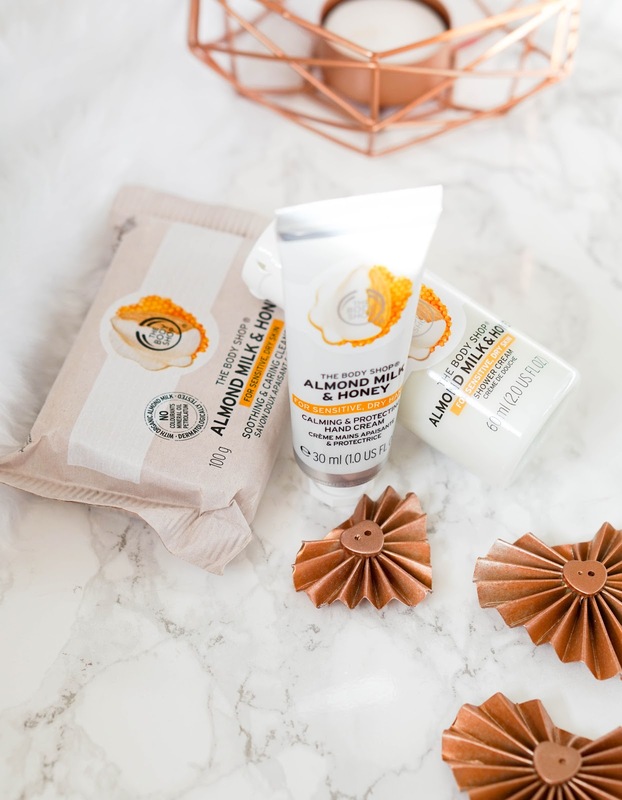 I've had a great experience with each brand and have been impressed by these new beauty products, so I thought I would tell you all about these new beauty additions..
First up I have a couple of products from The Body Shop's newest Almond Milk & Honey range. I only have a few samples from the range, so it's really more of a first impressions, but it's definitely made me curious about the rest of the collection & I will surely be popping into my local store to check out the products fully. This collection focuses of creating products specifically designed for sensitive skin.. to help soothe signs of irritation, redness, dehydration and dryness. All products from the range are enriched with organic almond milk from Spain and Community Trade honey from Ethiopia. The formulas have been dermatologically tested and they have a hypoallergenic fragrance too. The Almond Milk & Honey Calming & Protecting Hand Cream*, has become a staple in my handbag. It really does provide my dry hands with an instant hit of hydration, whilst soothing & protecting the skin further. The scent is really calming to use and it leaves my hand feeling silky soft. The Almond Milk & Honey Soothing & Caring Cleansing Bar* is not something I would have ever bought, as I always think of soap bars like this being quite drying and find them a bit impractical in general. This creates nice bubbles, smells amazing and feels super gentle on the skin. I also like that my skin feels moisturised after using it. It may not be practical, but I do love how it leaves my skin feeling. Next I've got a completely new brand to me, one that I hadn't heard about until Cult Beauty introduced me to it. 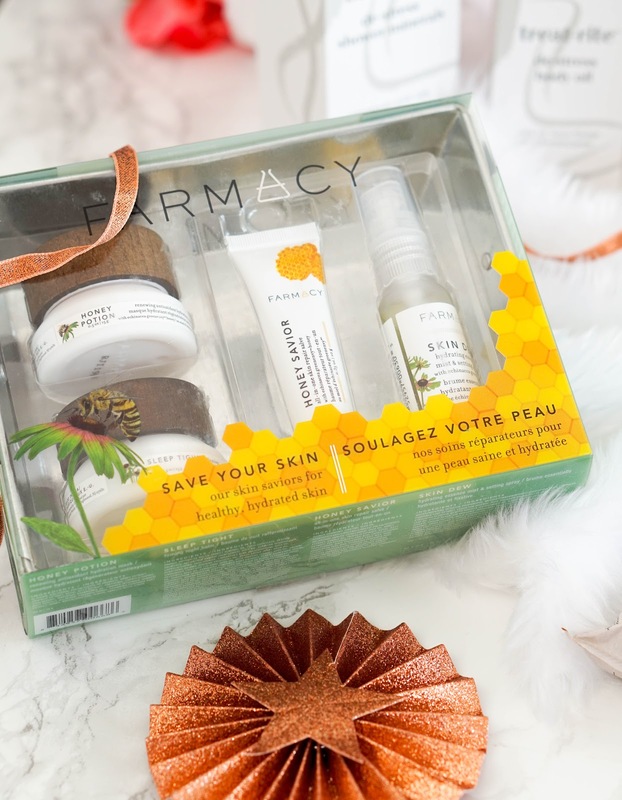 It's The brand I'm talking about is FARMACY, which focus on creating skin care using the 'farm-to-face' philosophy. They cultivate and farm their own ingredients so everything is extremely fresh. These are then activated in the lab to maximise their benefits. The brand have their own ‘hero’ ingredient.. the patented Echinacea GreenEnvy complex. This is an antioxidant-rich powerhouse, which works on firming the skin and protecting it from the ageing effects of free radicals. I was sent their Skin Savior Kit* which is the perfect way to try out the brand. 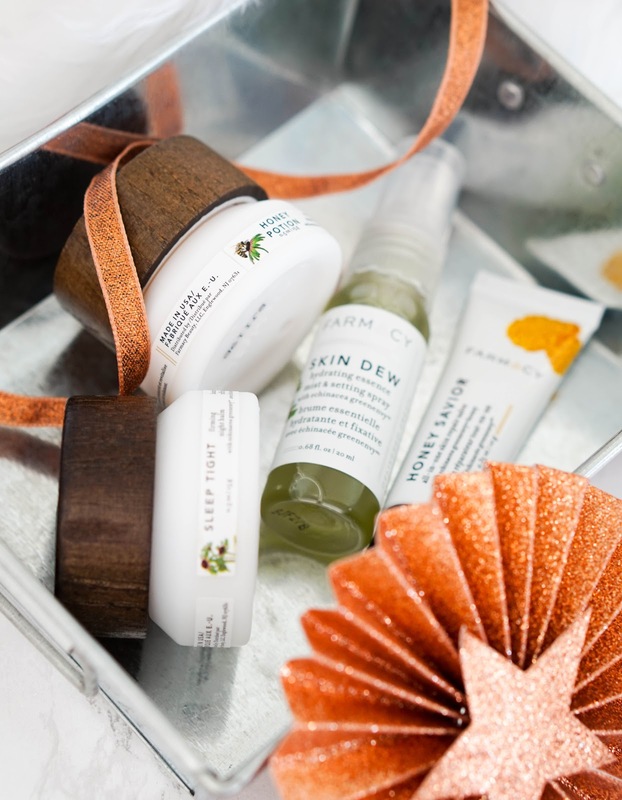 The kit contains four of the brand's bestselling products, all organic and natural. The sizes are all generous deluxe samples of the Honey Potion 15g, Honey Savior 10g, Skin Dew 20ml and Sleep Tight 15g. These all work together to soothe and strengthen the skin. The products contain protective antioxidants, healing honey, vitamins, minerals and amino acids. I've been using the kit for over a week now and I love how luminous my skin looks and it feels nourished too. I love the metal tin that all the products come presented in and it's really made me curious about the whole brand in general and trying out more from the range. 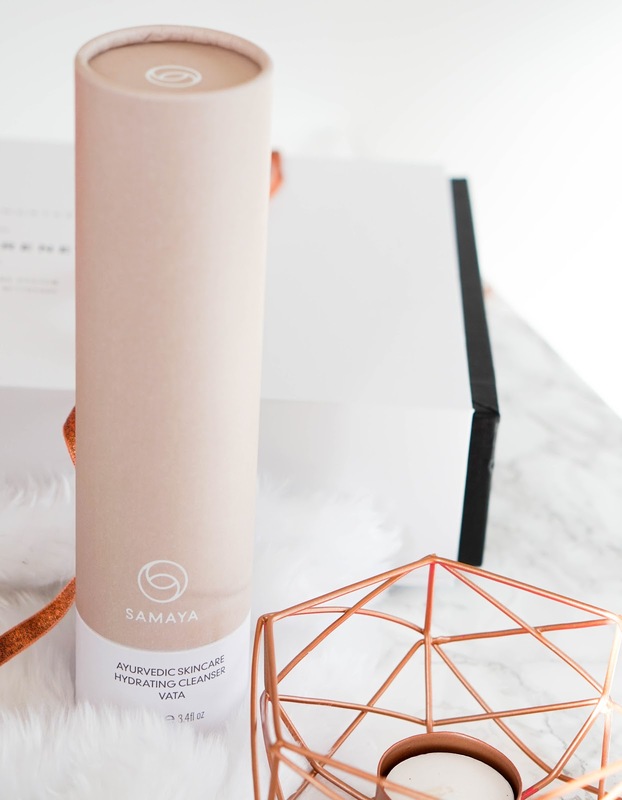 I've then got another product from SAMAYA, a brand I introduced to you not that long ago in my 'relaxing evening' post. Continuing on with the range that works best for my skin and lifestyle, I've been using the Vata Hydrating Cleanser* since the beginning on the month. This cleanser has been formulated to cleanse and purify the skin, whilst hydrating it at the same time. It contains powerful Ayurvedic botanicals such as Rose, Turmeric, Tulsi, Gotu Kola and Ashwagandha.. which all have amazing skincare benefits. I remove eye makeup first as I always do and then use this for the rest of my face. I massage 2-3 pumps of the creamy balm, which literally melts into my dry skin. This removes makeup and any kind of impurities easily and effectively. It emulsifies on contact with water and can be washed off easily, with or without a face cloth. I alternate between using water only and the muslin cloth, depending if I need to exfoliate my skin. Another lovely product from the brand, which not only looks luxurious but feels amazing on my skin, helping me achieve a more radiant complexion overall. Next I have another new brand, this time focusing on body care. 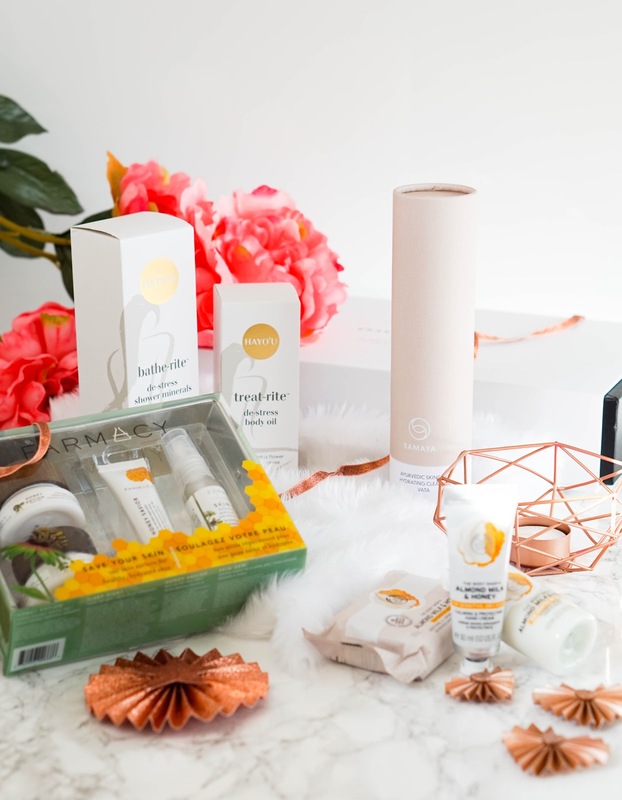 This a new British wellness brand Hayo’u, focuses on de-stressing with the use of lavender in all their face and body products, to help ease tension and soothe stressed skin. The brand believe that by incorporating lavender into your daily bathing and moisturising routines, you can improve sleep quality, reduce anxiety levels, enhance blood circulation and restore radiance to lacklustre skin. After a bit of research, I can easily see that lavender is considered a powerful ingredient within the world of beauty. It has natural antiseptic and antifungal properties so perfect for skin inflammations, as well as being universally recognised to help speed up the healing process of wounds, cuts, burns and sun damaged skin. I was sent two products from the brand.. firstly the Hayo’u Treat-Rite De-Stress Body Oil* which is a concentrated massage treatment oil. It has been formulated with sea buckthorn and rice oils, which deeply nourish the skin. The oil is also infused with lotus flower, lemongrass and frankincense, known for their energetic properties to help de-stress. Next the Hayo’u Bathe-Rite De-Stress Shower Minerals* is a concentrated formula of Himalayan pink salt and magnesium that work together to help draw out tension and stress. It's also infused with lotus flower, lemongrass and frankincense to lift your spirit. Both products combined work amazingly well to help you feel relaxed and calm, even if you've had the most stressful day ever. They also feel silky soft on the skin and provide intense nourishment. 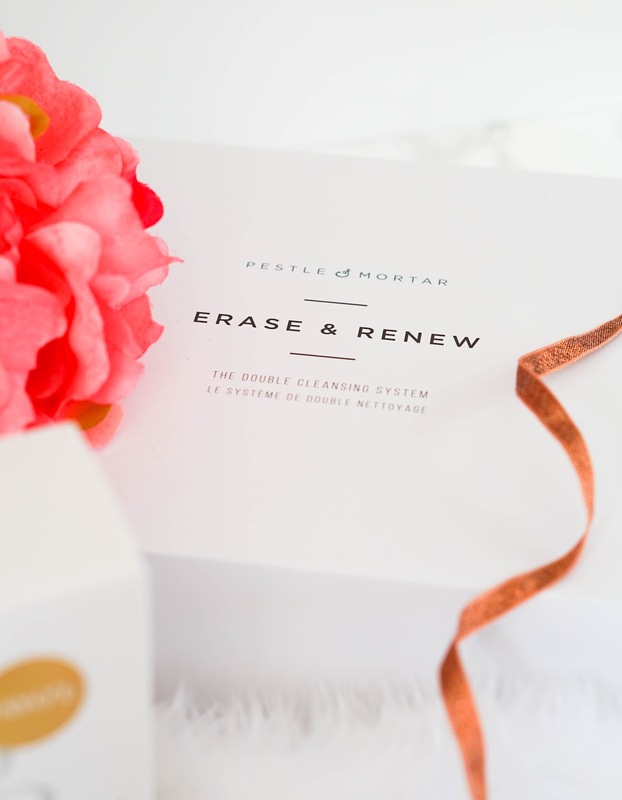 Lastly I have a brand that I love, Pestle & Mortar, as I am trying out their newest product releases.. the Erase & Renew Double Cleansing System*. Double cleansing your skin is all the rave at the moment and whilst it's not something that I use daily, I do agree that it's worth taking the extra steps in your skincare routine when you can. 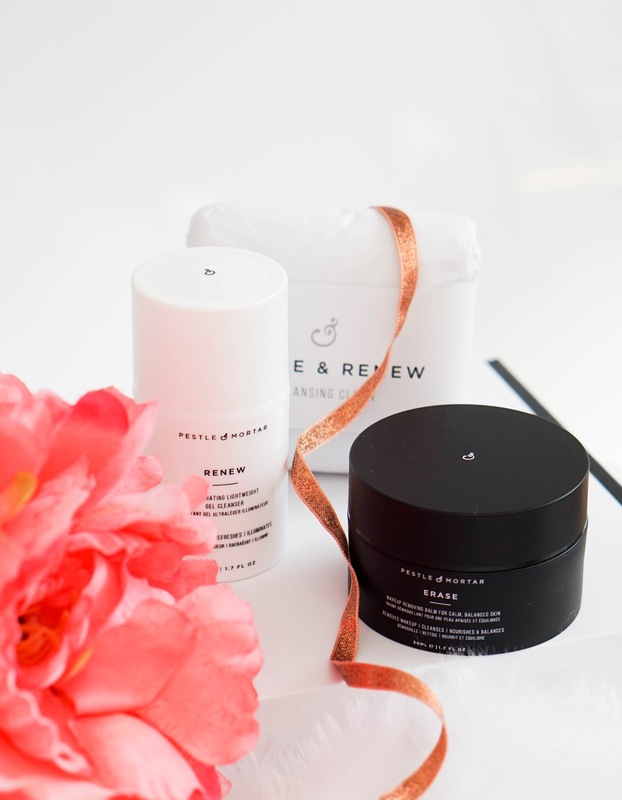 The Pestle & Mortar Double Cleanse System is made up of 3 components: Erase - a makeup removing balm, Renew - an illuminating lightweight gel cleanser, along with a double cleanse facial cloth. When my skin is feeling a bit dry and looks dull, I always find this technique of double cleansing super effective. Not only are you removing makeup, but you are also removing impurities and dead skin cells, in a gentle way.The first step here is the Erase Makeup Removing Balm, which is a solid that should be warmed up in the palm of your hands and massaged into the skin. 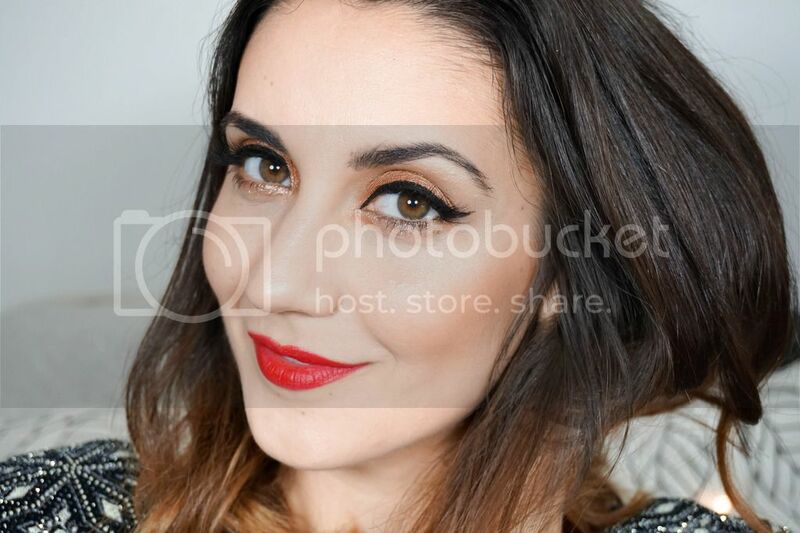 It helps to break down makeup, even stubborn eye makeup (not that I like the whole panda eye look). The balm is a nourishing blend of cold pressed grape seed oil, pumpkin enzymes and prickly pear seed oil to promote cell renewal, retain moisture and fight free radicals. This should be removed with the exfoliating muslin side of the face cloth included. Then you can move on to step two, which is the Renew Illuminating Lightweight Gel Cleanser. Formulated with meadowfoam seed oil, papaya and mango enzymes, to improve skin texture and tighten pores. This lightweight cleansing gel leaves skin feeling brighter, more hydrated and glowing overall. This is again removed with the face cloth included, but this time you are using the smoother cotton side. I am loving how soft my skin feels and how radiant it looks when I take the extra time in my routine to use this double cleansing system.